Former NTSB officials, from right, Greg Feith and John Goglia (also an IAM member at US Airways) teach participants how to conduct an accident investigation, and protect themselves from site contaminants, as part of the District 142 Flight Safety Committee training at the William W. Winpisinger Center in Southern Maryland. The IAM’s pioneering Flight Safety Committee Program helps Aircraft Maintenance Technicians (AMTs) keep industry maintenance standards high, deal with their ever-changing regulatory work environment and has a special program to train AMTs to participate in accident investigations. District Lodge 142’s Flight Safety Committee met at the Winpisinger Center and set a new level of training with instruction by former National Transportation Safety Board (NTSB) officials, other airline professionals and practice on an actual damaged aircraft. Click here to view a video about the class. The conference included participants from Air Wisconsin, US Airways ExpressJet, and Transport Workers Union (TWU) Representatives from American Airlines. Flight Attendants from ExpressJet learned about the Critical Incident Response Team (CIRT) program that is designed to meet the needs of Flight Attendants who are involved in aircraft accidents. Railroad representatives were briefed about expanding NASA’s Safety Reporting system use in the railroad industry. 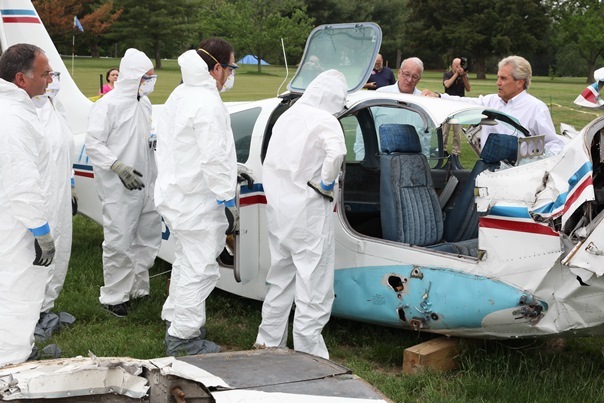 Participants learned from former NTSB officials, including a hands-on investigation of a damaged aircraft, to become members of “Go Teams” that respond to aircraft accidents. AMTs bring a unique knowledge of aircraft systems that can help investigators determine the causes of an accident so it won’t occur again.